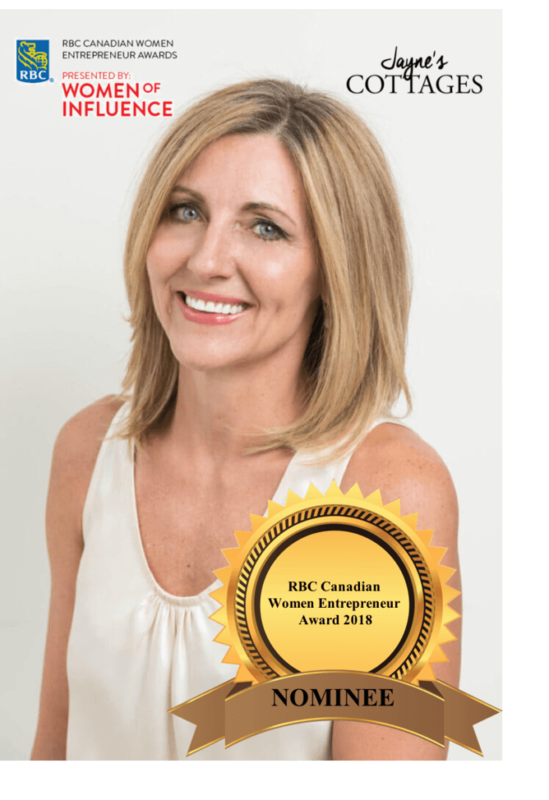 Jayne’s Cottages is thrilled to congratulate our captain, Jayne McCaw, on her nomination by RBC for a Canadian Women Entrepreneur Award 2018 presented by Women in Leadership. The RBC Canadian Women Entrepreneur Award is a premier national awards program that celebrates the achievements of the most successful women in different categories of entrepreneurial work. Over the last 26 years, thousands of women have been nominated and recognized for demonstrating excellence — from economic growth to social change, from local to global reach, across multiple sectors. This award celebrates the collective impact of leading women, and Jayne has certainly made an impact. Since Jayne’s Cottages was born in 2014, Jayne has grown her business from a handful of cottages to over 120 properties in Muskoka, Toronto and Florida. She has developed a professional line of concierge services to offer her clients the amenities of a hotel-stay, even at the cottage. During her peak summer season, Jayne manages a full-time staff of over 35 employees. Jayne is so proud to have built her Muskoka business from a labour of love into a leader in the Muskoka market. Hard work, countless sleepless nights, and thousands of clicks on Muskoka roads and lakes have allowed her to put her lasting mark on an new industry in Muskoka. Her nomination for the RBC Canadian Women Entrepreneur Award is a testament to just that. To learn more about the 2018 RBC Canadian Women Entrepreneur Awards, visit http://www.womenofinfluence.ca/rbc-cwea/#.Woc1vzuYdSU.